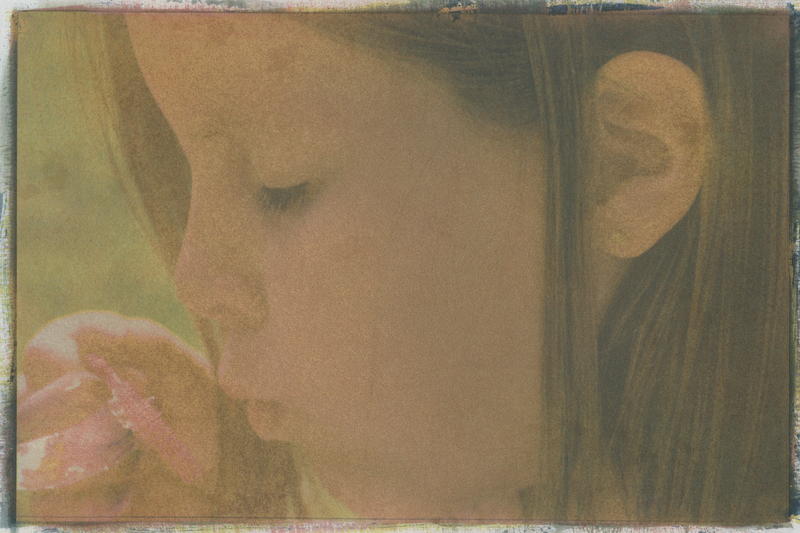 Gum Bichromate printing is an alternative process that allows you to print as many or few colors as you prefer, using watercolor pigment. 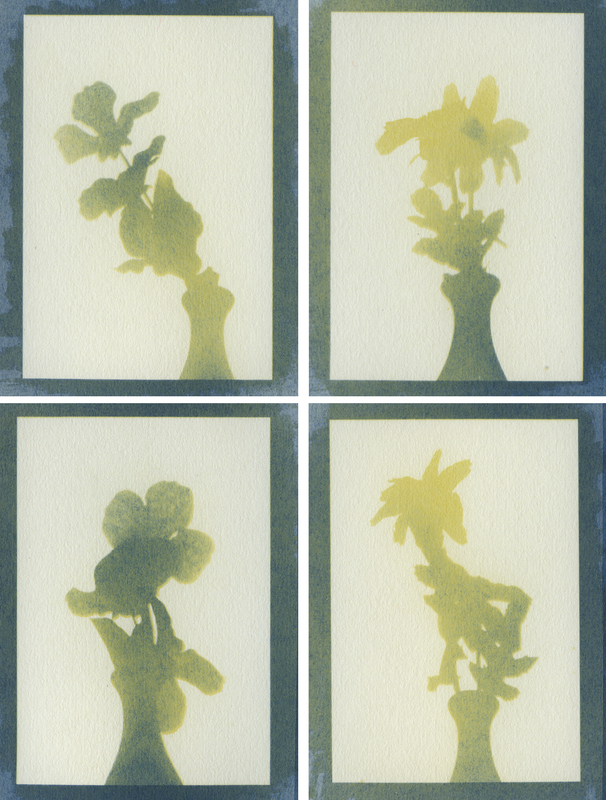 Here are a few trial prints and how they look after each color pass. 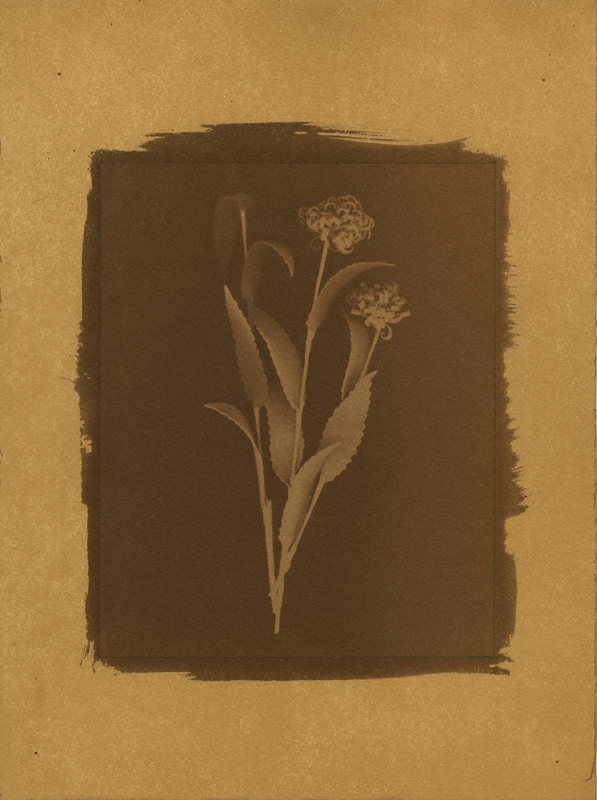 Each pass consists of coating the paper with sensitized pigment solution, drying, contact print exposure under UV light, development, and drying. 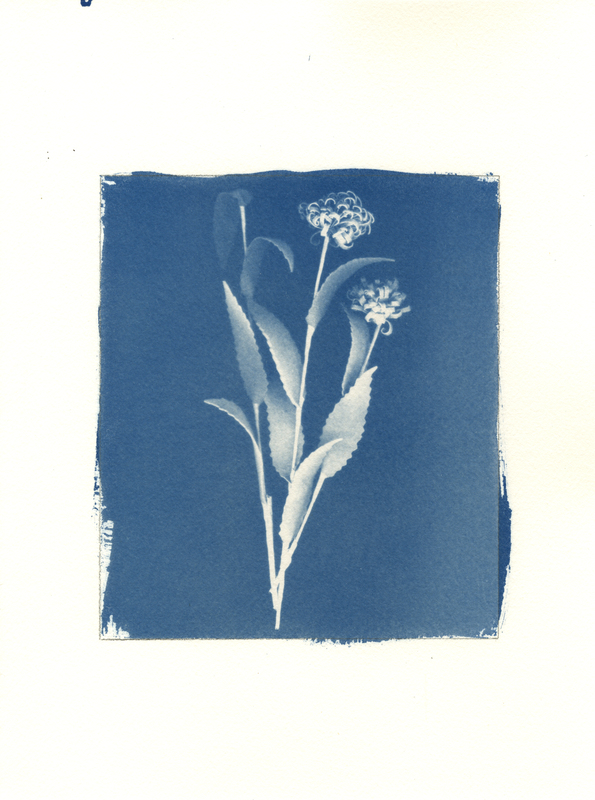 (In a smaller print the cyanotype responded nicely, these were 3″ x 4″. 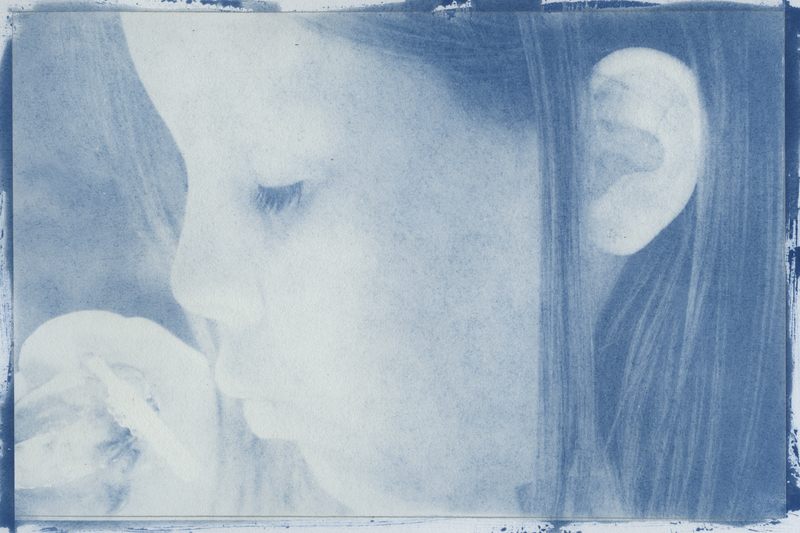 The cyanotype can have a tendency to bead up on larger surfaces that have a lot of gum built up). 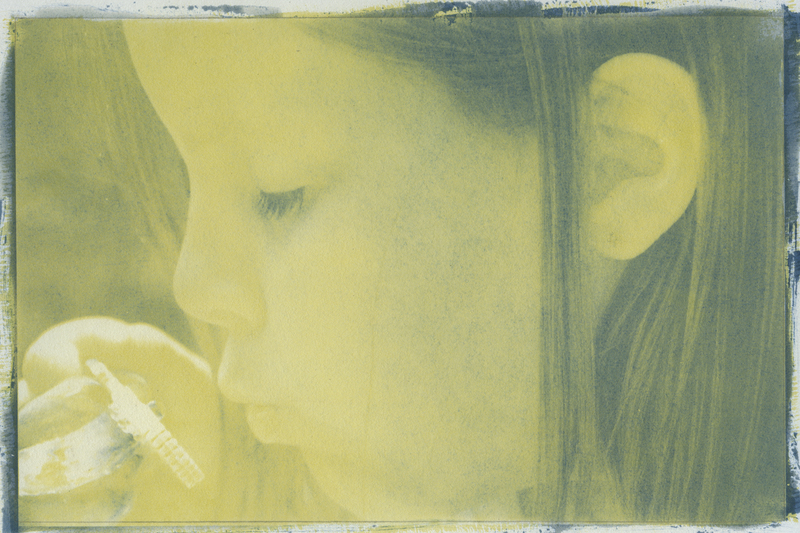 This is a trial print in which I was working with curves and a different method for preparing my digital negatives in attempt to get more detail in the hair and face. Black Pass (The method I was trying did not work well on this seperation negative. 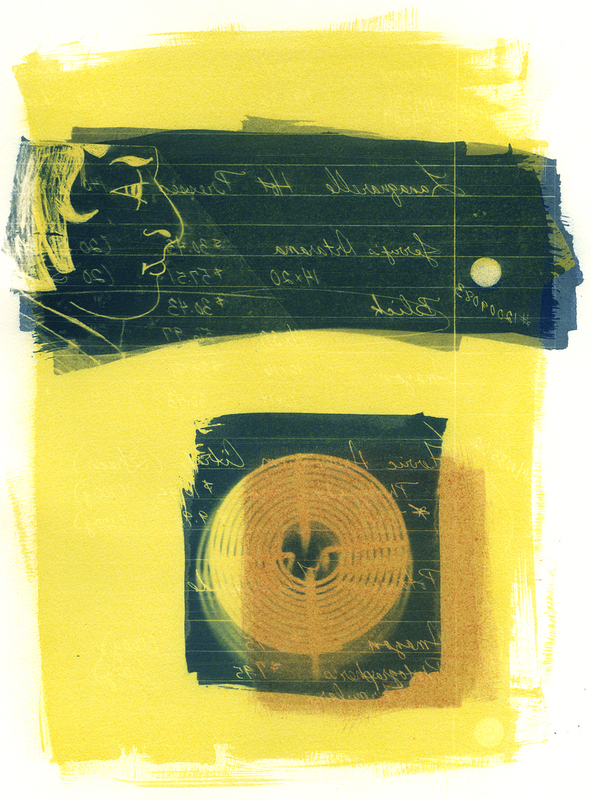 It did not block the highlights and muddied down the print). 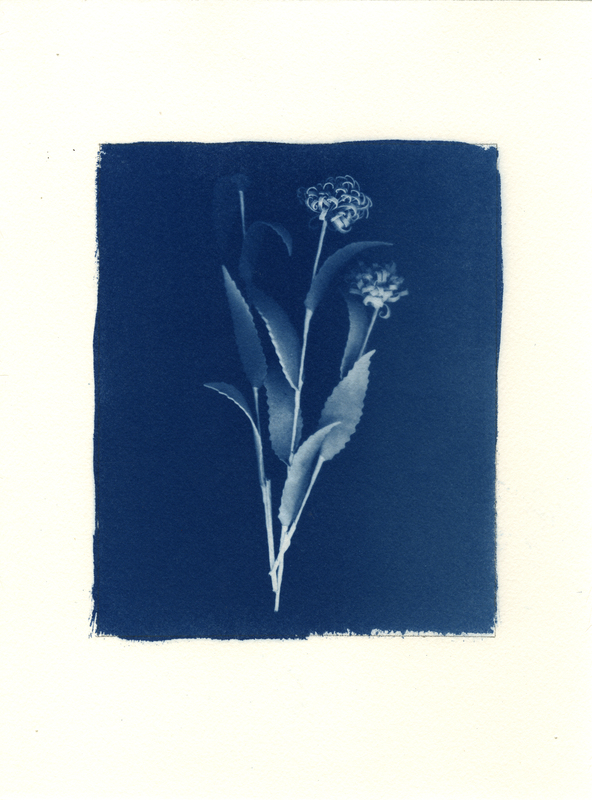 Final Cyan Pass (Cyanotype. 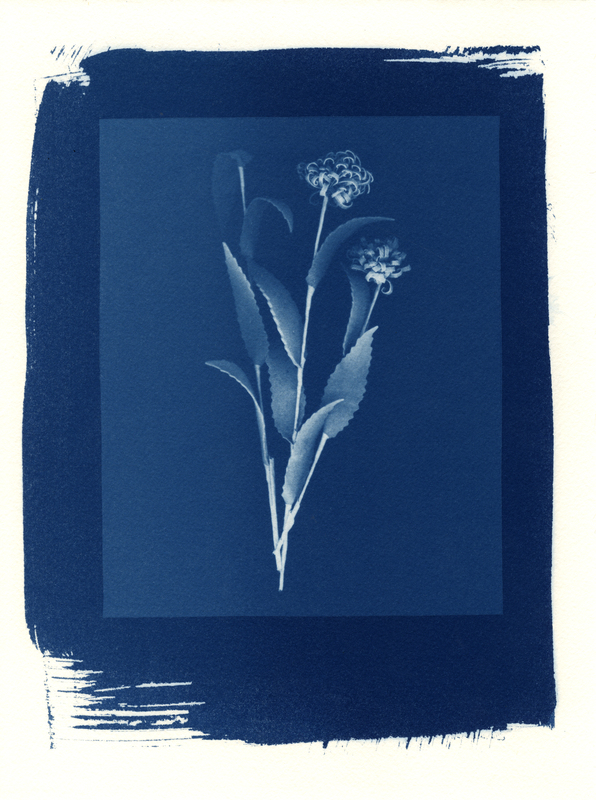 This is an example on how the Cyanotype may not work well on larger prints. 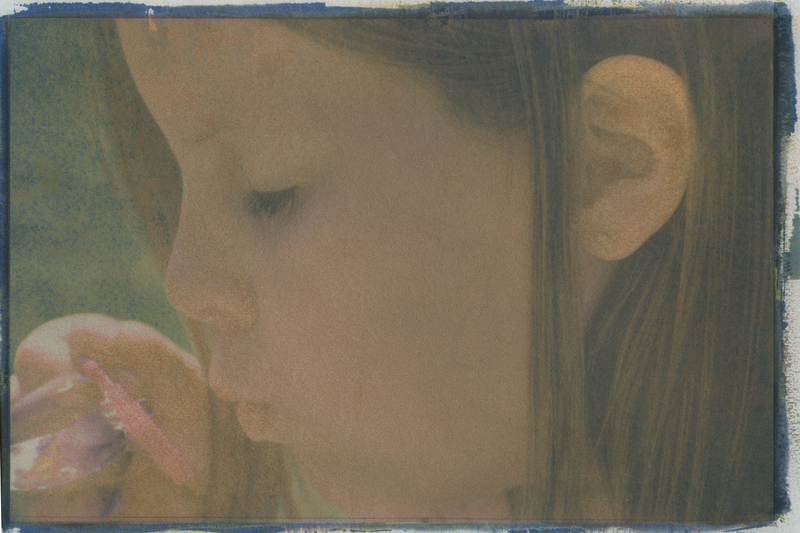 This is around 7″ x 11″ and you can see areas in which the cyanotype beaded up). 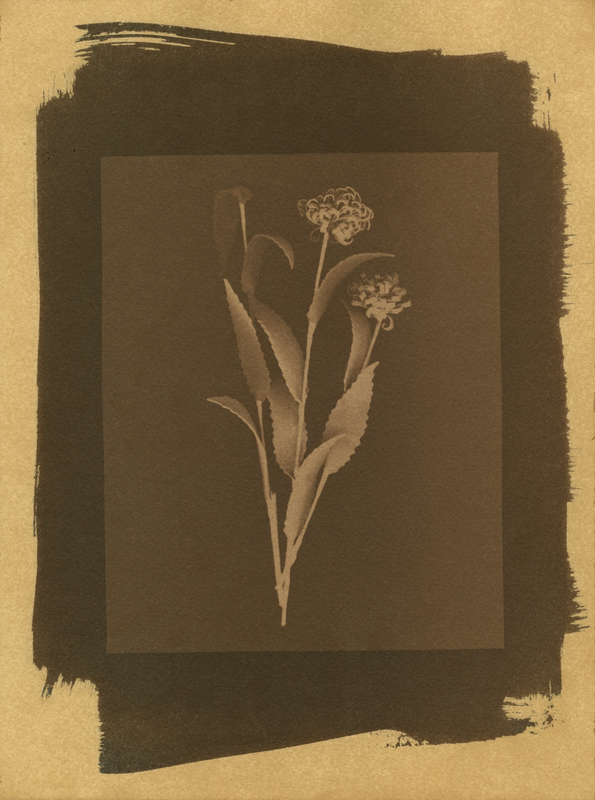 You will also be able to see that this method compared to the image below, can produce flat flat/dull results. 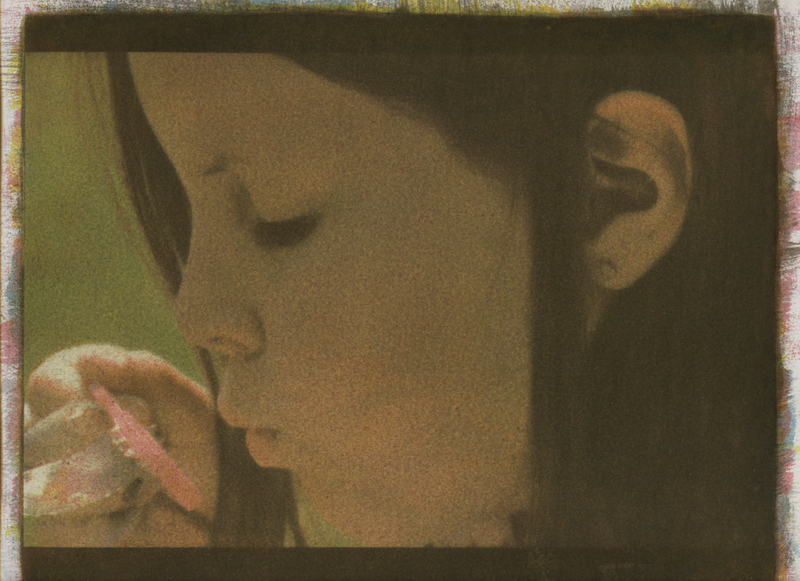 I have not tried to build the colors up with multiple passes … that may be the answer to producing a richer look. 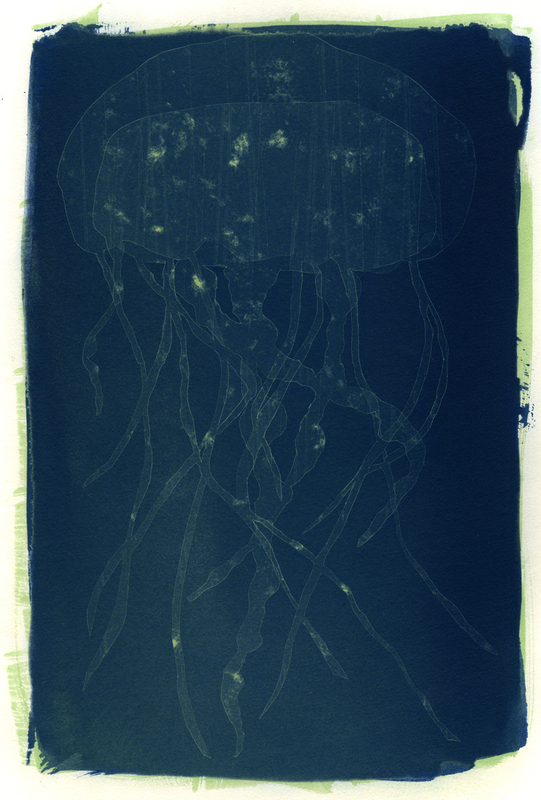 This is the “summertide” print using gum for each layer, including the Cyan pass. The exposure time was a lot higher as well. 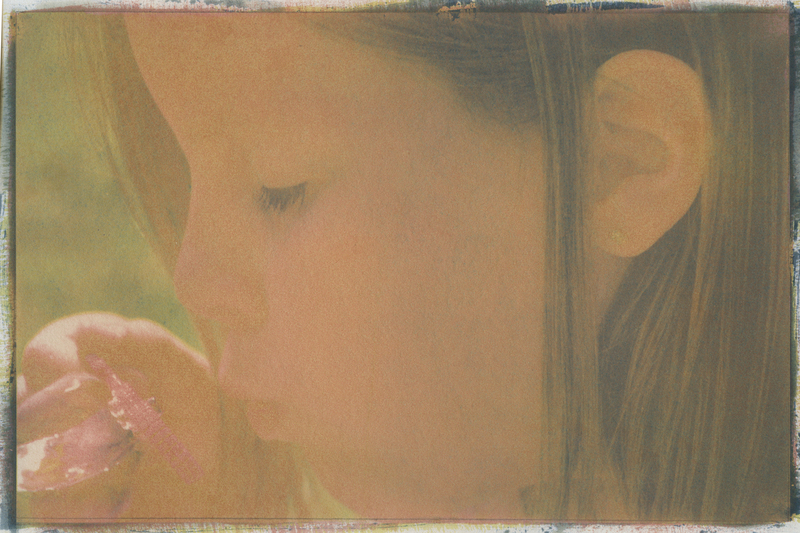 While I find the rich quality to be absolutely gorgeous, I lose the detail because the pigment layers begin to block up. 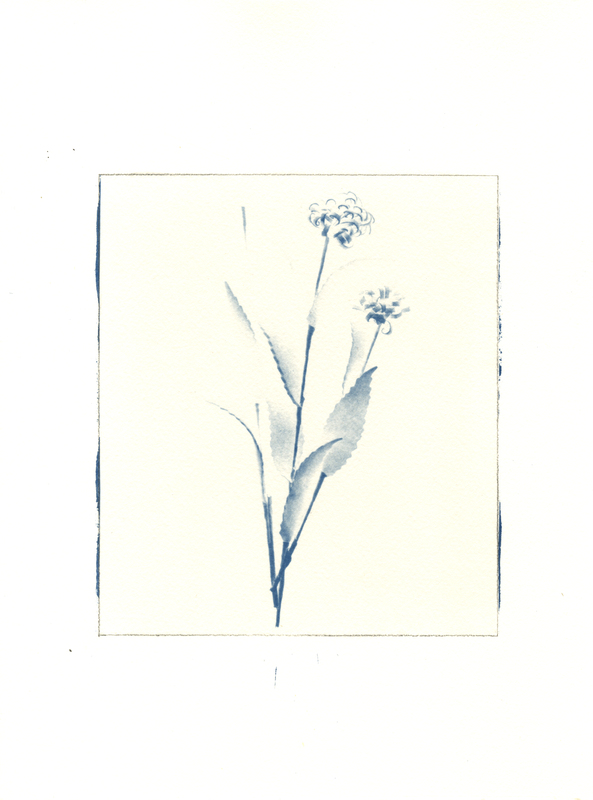 In the mean time, I’ll continue to work to find a happy medium between the above print and this print. 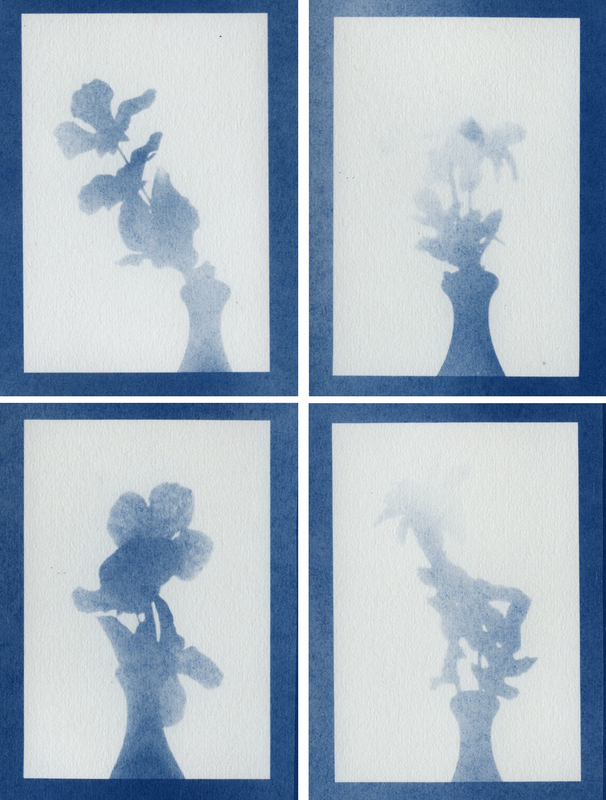 This first set of Cyanotype prints are developed in a water bath for five minutes, water and a couple capfuls of peroxide for 2-5 minutes, and a wash for five minutes. 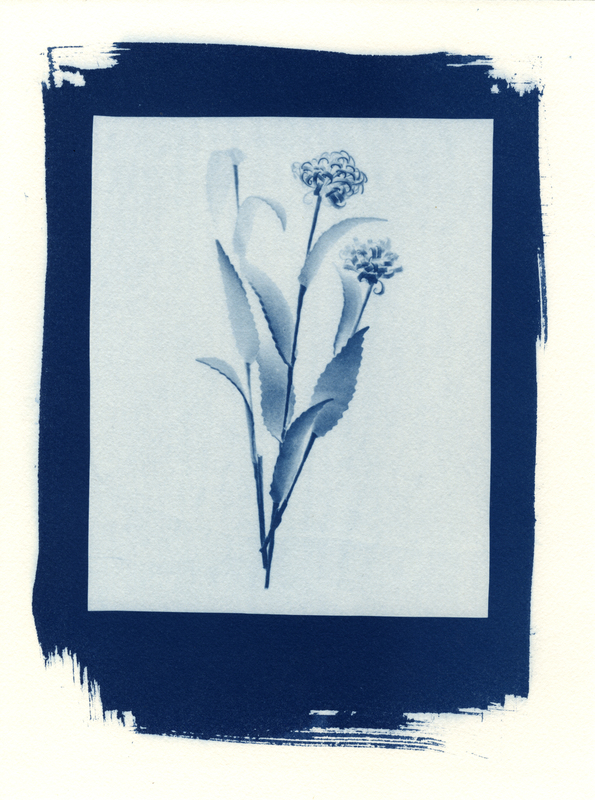 The two sets of Cyanotpye prints below are developed in vinegar for 1 minute and washed in water for about 20 minutes. 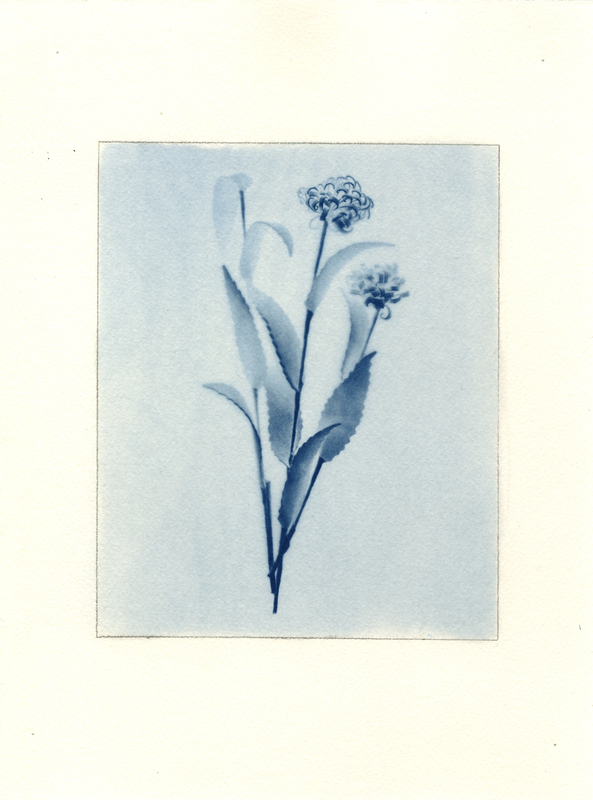 Iit takes a lot longer for the water to clear with this method, but the vinegar brings out the mid-tones and intensifies the prussian blue beautifully. (5% glacial acetic acid to 95% water yields identical results). 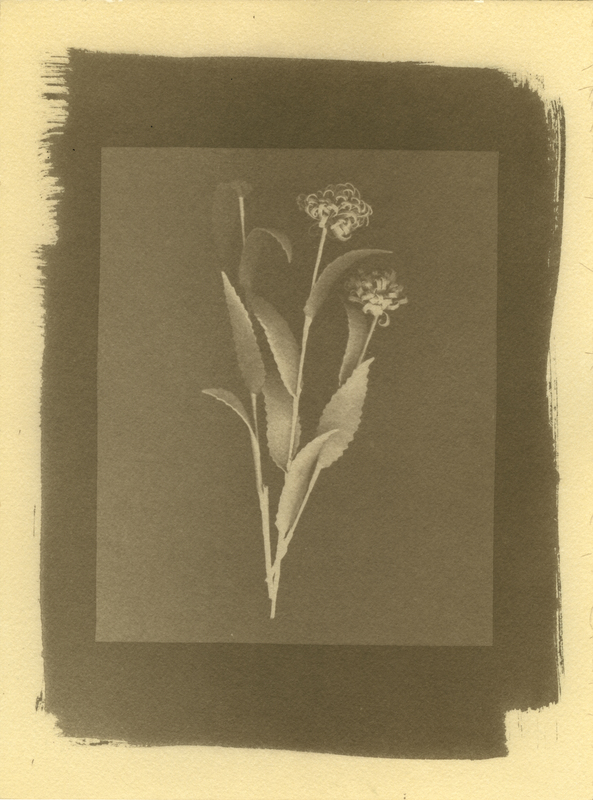 The following two sets are toned with tea. 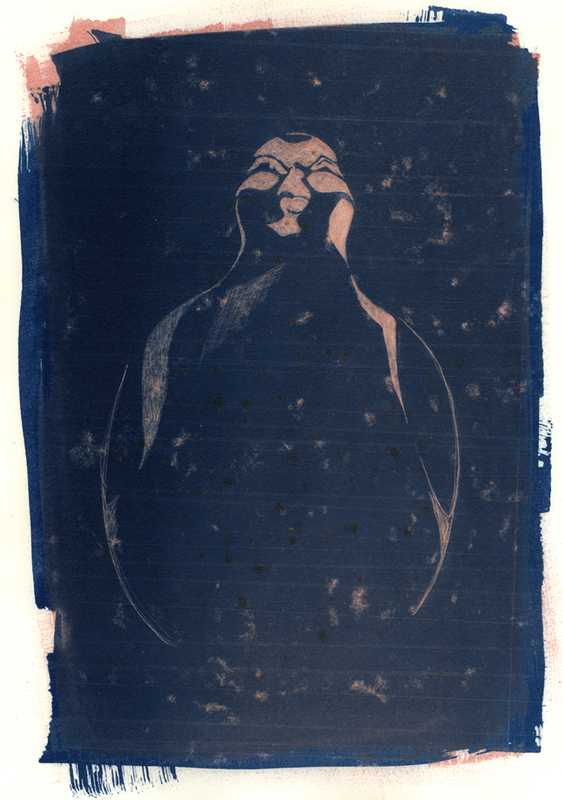 Note: I have not yet toned any cyanotpe prints that have been developed with vinegar. This set was wet, bleached with Arm & Hammer sodium carbonate, washed, toned with black tea (8 bags of Lipton tea to 2 quarts of water, boiled and cooled to room temperature) and washed again until water ran clear. 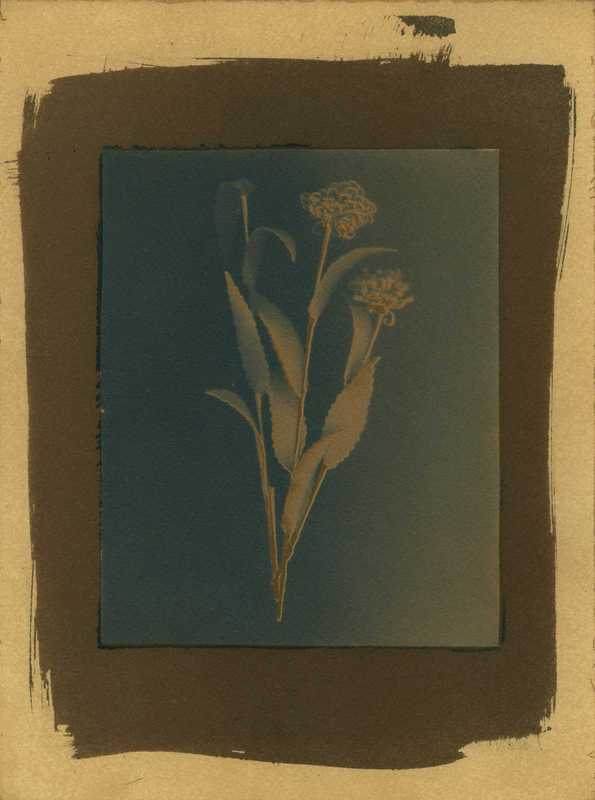 The second image was coated again with Cyanotype, exposed and developed with the water/peroxide method. The next two images were wet, bleached with Arm & Hammer sodium charbonate, washed, toned with black tea (8 bags of Lipton boiled in 2 quarts of water and cooled to room temperature), washed until water ran clear, placed in bleach bath for a second time and washed, back into the tea for a second time as well, and a final wash until water ran clear. 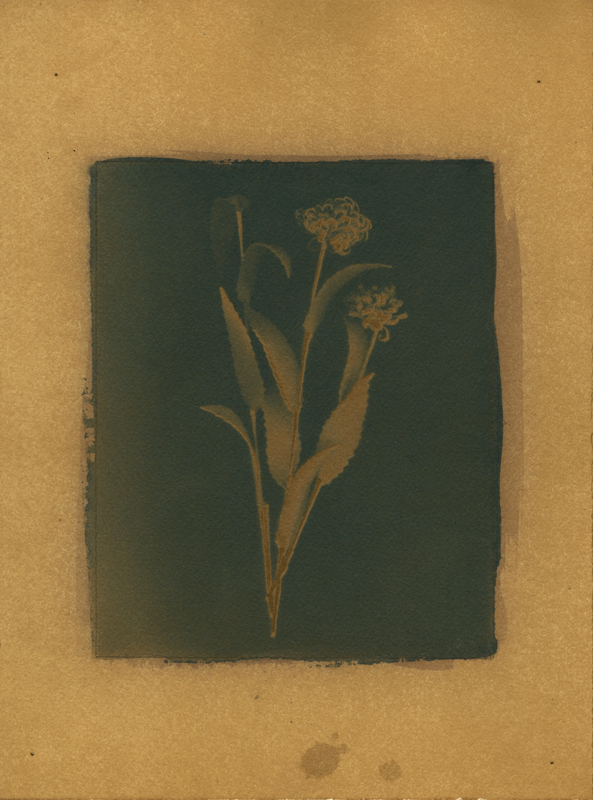 The second image was coated with cyanotype again, exposed and washed with the water/peroxide method. Finally, here is a set that I toned in coffee. The steps were the same as the tea tone. 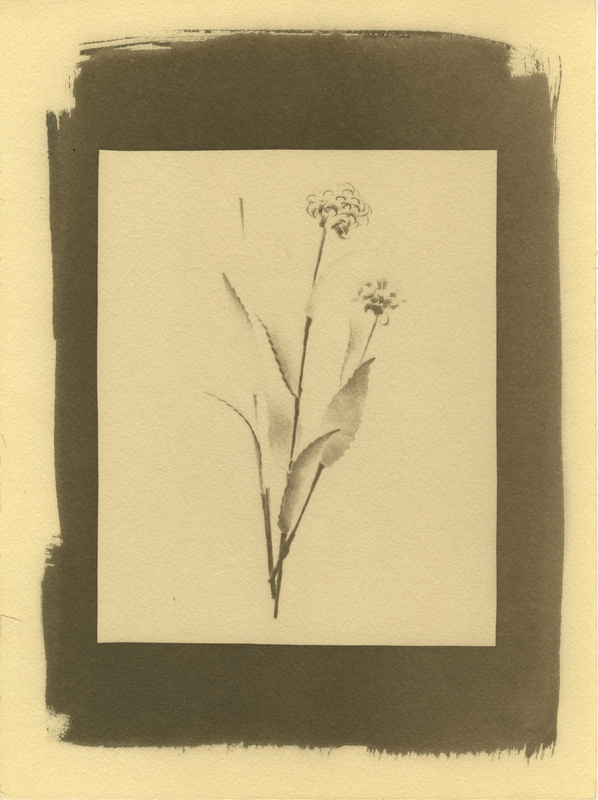 I wet, the cyanotypes, bleached in sodium carbonate, washed, toned in coffee (1/2 cup of cheap black coffee brewed to 12 cups of water and cooled to room temperature) and a final wash until water ran clear. Thank you very much for visiting my photo blog!